Utah might be my favorite destination for a road-trip getaway. It's an easy six or seven hour drive from my home in San Diego and it's a portal to so many beautiful outdoor destinations and always fabulous adventure. So needless to say I was overjoyed when a recent magazine project for Vertical 911 required I drive over and spend a week. The focus of this project was Classic Air Medical, a helicopter air medical provider based in Utah. What I found so interesting, however, is where they have established bases. They presently have eleven bases in six western states; Utah, Wyoming, Colorado, Idaho, New Mexico and Arizona. But instead of following a business model embraced by similar operators of locating bases near large population centers or hospitals, Classic has taken a slightly different approach. Classic's bases are in relatively small towns like Steamboat Springs CO, Moab UT, Riverton WY and Page AZ. But these small towns are magnets for all kinds of outdoor enthusiasts and adventure seekers. 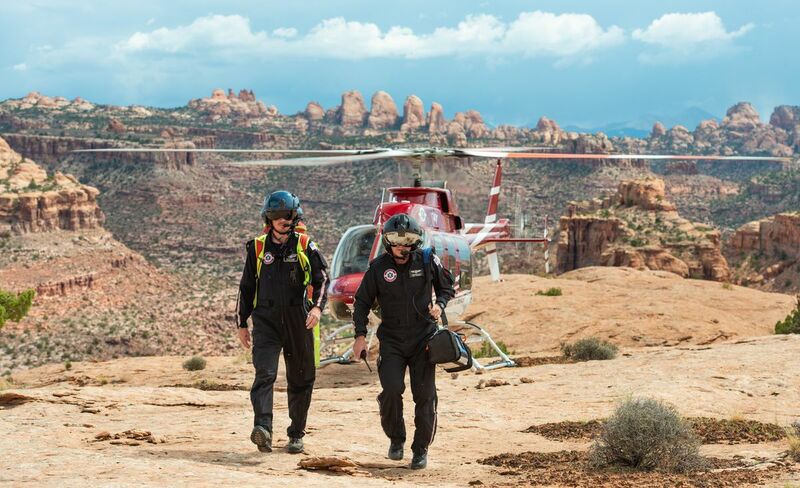 While Classic performs the traditional air medical role of transporting patients to hospitals, they also bring the added capability of performing search and rescue, (SAR), which is particularly valuable to the communities they serve. In fact, Classic gives away up to two hours of free flight time to the local communities when requested by the local public safety agencies. This means Classic pilots and medical crews are uniquely equipped and skilled to work among steep and rugged terrain to conduct SAR missions, provide advanced medical care to a survivor and fly them to safety or to a hospital. One of the highlights of this trip was a helicopter flight we made for an air to air photo shoot, from the tiny airport in Page AZ on the shores of Lake Powell, up to Moab UT. Our 160 mile flight took us low level across Glen Canyon National Recreation Area and Canyonlands National Park. We were treated to some of the most incredible landscapes I have ever seen. Once in Moab, we met up with a crew who had flown down from Steamboat Springs to be our 'subjects' for the shoot. Thunderstorms in the area limited where we could safely shoot but we found an ideal setting just south/west of town in some of the most magnificent red rock formations I had ever seen. After an hour or so air to air shooting I suggested we land and put me out on foot to shoot. When I first exited my helicopter and stepped out onto the red slick rock I remember standing there for several minutes just taking in the incredible views. Yes, I was a little envious of these crews who get to go to work here everyday. But I was also thankful to have spent this time to learn about Classic Air Medical and understand such skilled pilots and medical crews were available, even in these wild and remote locations. If you're interested in reading the two articles that came out of this trip I invite you to click or copy and paste the link below into your browser to read the entire fall 2018 edition of Vertical 911.